Disclosure of Material Connection: Some of the links in this post are “affiliate links.” This means if you click on the link and purchase the item, I will receive an affiliate commission. Regardless, I only recommend products or services I use personally and believe will add value to my readers. I am disclosing this in accordance with the Federal Trade Commission’s 16 CFR, Part 255: “Guides Concerning the Use of Endorsements and Testimonials in Advertising.”I love cooking in my Crockpot , I use it at least once a week. It makes cooking easier and I love that I can prep dinner in the morning and it is ready at dinner time. 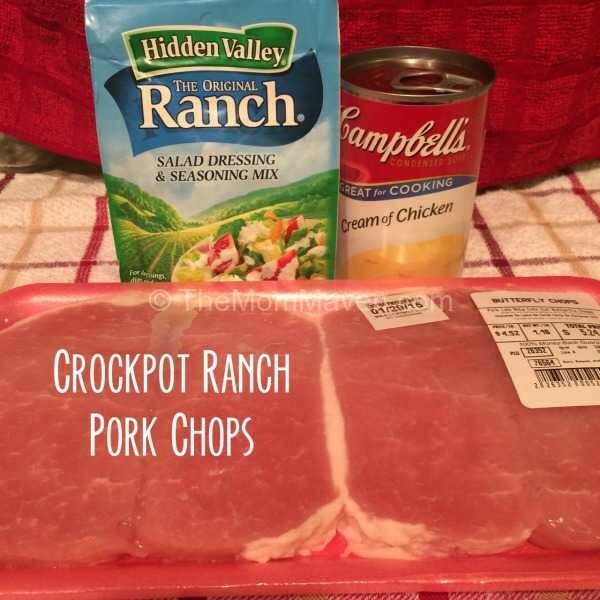 Today’s Ranch Pork Chops Recipe is simple and is perfect for a beginner but tastes delicious and has quickly become a family favorite at my house. This recipe only calls for 3 ingredients-how simple is that? We have decided that we like it best served over egg noodles but you can serve it with a salad and mashed potatoes just as easily. This simple 3 ingredient crockpot recipe makes a delicious meal when served over egg noodles with a salad on the side. Spray the crockpot with non-stick spray. In a small bowl combine the can of soup, the Ranch dressing mix and 1/2-1 full soup can of water and mix well. Pour some of the soup mixture into the crockpot to cover the bottom. Place the pork chops in the crockpot. Cover the pork chops with the rest of the soup mixture. In a small bowl combine the can of soup, the Ranch dressing mix and a soup can of water and mix well. Label a gallon size freezer bag with cooking directions. Pour the soup mixture into the freezer bag. Add the pork chops to the freezer bag, seal and squish to mix well. When you are ready to cook, defrost the contents of the bag, pour into a crockpot and cook on low for 4 hours. We like this recipe served over egg noodles. 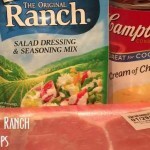 Easy Crockpot Ranch Pork Chops recipe uses only 3 ingredients! 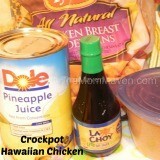 I hope you enjoy this Crockpot recipe and all of the easy recipes I share here on The Mom Maven. I hope you share them on your social networks. I just ask that you not copy and share the entire recipe with photos. Please use the sharing buttons below and share the link to this post. Thanks! These recipes might interest you too! 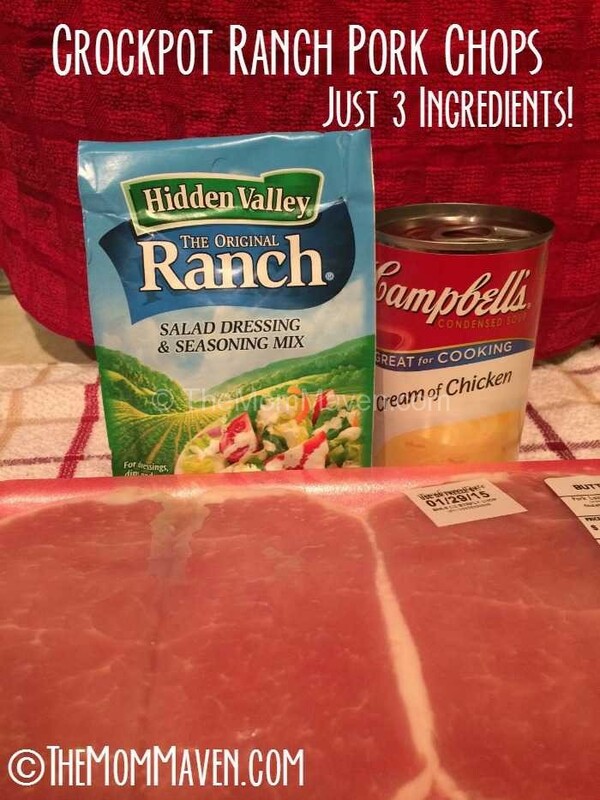 You can’t beat 3 ingredients! 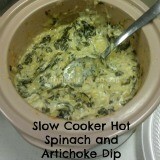 Thanks for sharing – I’m always looking for easy crockpot meals. Cyn Hughes recently posted..Brief visit to London? Add these stops to your list! Hey! Wanting to try thing tonight! Do you think you could use chicken drumsticks instead of pork chops? I have done it you just have to remove the skin. These are really good and super easy…..do not salt the chops, could be too salty. I have really thick pork chops, double ingredients and may hour and 1/2 ? I am all over this recipe. I use my crock pot almost every night of the week. This is do able and super fast / easy! Thanks for the recipe. My husband would probably love me forever if I made that. I rarely cook pork but those mix of ingredients actually make me want to. It is easy and delicious! Hey we have a fairly large family so I am doubling the soup, doubling the ranch for a total of 8 chops. How long should I increase the cook time? Wow, looks easy and quick. I love these types of recipes for days when I just don’t have time. My family would love these and I adore anything that I can make in the crockpot! Can’t wait to try out this recipe! It’s in crockpot now. Hope it taste great! I hope you liked it Victoria! I have friends coming for dinner tonight. I’m going to try this. Can you put the porkchops in frozen? I put mine in frozen and cooked on low for 6-8 hours. Pork falls apart and is super delish. I did use 2 can of soup though because of longer cook time. So do I use a 10oz can of cream of chicken? It just says can so I’m not exactly sure. Also it’s thin slices I should use right? Plan on making it this weekend ? Yes it is a typical 10.5 oz can of soup. Yes I did this morning.. I hope you enjoyed it Kala! Can I put on high for 2 hours? So I’m trying to work with what I have on hand this week. I have packets of McCormicks Ranch dip seasoning. Wondering if that would work? Starla, I am thinking that should work fine. I’m not sure, I’ve never tried it. I just made this recipe and it tasted great, but the sauce was incredibly watery. Any tips on how to fix this? Alexandra, I’ve never had that problem. The only liquid is the cream of chicken soup which is thick so I’m not sure why it would be watery. The Recipe says to use a can of water with the soup and ranch mix. I have never had trouble with it being too watery. I would suggest cutting back to a half can of water and trying that. Use a mug to dip out about a cup of the liquid, mix 2tbs corn starch into the liquid, integrate this mixture back into the dish. This will thicken it, if it is not enough for your liking repeat the process. Thanks, I’m having the same problem with it being too watery. I think mine was that way because I used a full can of water and frozen pork chops too. Same Issue, Watery – its that can of water. Did you do anything to thicken it? Cornstarch thickens anything. Use that. Do you have to freeze the ingredients first or can you just mix and cook? The ingredients do not need to be frozen first. I don’t have an option for low 4 hours. I have options 4 and 6 hours for high. And 8 and 10 hours for low. Suggestions? Umm, I’d say it’s time for a new crockpot! My crockpot has the same settings as Heather’s and it’s new. I made this tonight with 3 regular sized boneless center cut pork chops. I used cream of mushroom soup with 1/2 can of water. I read the instructions wrong and set it on high planning on 4 hours. I happen to re-read the directions again after it had been cooking 3 hours on high that it was suppose to be on low, so I figured it was done. It turned out fabulous as the meat was so tender. I also found the gravy to thin for my liking so I added 1/2 brick of soften cream cheese and a small amount of flour to thicken after I took out the pork chops. It was also delicious and I served them with mash potatoes using the gravy for those as well. My husband isn’t much for food variety and this was a big hit!! Donna, that sounds like a great way to thicken up the sauce! Thanks for sharing. I am out of cream of chicken, do you think cream of celery would work? ayla, That should work. Others have used Cream of Mushroom. Enjoy! Do you fry the pork chops first, before putting in crockpot? No need to Raelene, they cook in the crockpot. Very good. I used bone in porkchops, cream of mushroom soup, and added fresh mushroom, pearl onions, and 1 stalk of celery. Delish and husband approved. Served with mashed potatoes and Brussels sprouts. Used corn starch to thicken some of the gravy. Yum. The porkchops are defrosting right now! I’m so excited to try this. I hope you enjoy it Kylie! i used frozen. i forgot to defrost night before and I use 2 cans of soup and 1 can of water and cooked for 6-8 hrs on low since they were frozen and i wasn’t going to be home 6 hrs. They just fell apart and super tender. I have this cooking right now!!! I can’t wait to try it!! In the crock pot now. Can not wait to try. Smells amazing already!!! Linsey, Adding potatoes may soak up some of the sauce. If you give it a try please let me know how it turns out! I’m cooking bone in chops, cream of chicken soup, I quartered a few taters. And sliced a whole onion added a 4th of a stick of butter, celery flakes and 1 can of water also will be thickening the soup with a 1/2 a brick of cream cheese. I cannot wait for dinner. I add yellow baby potatoes cut up and I also cut up an onion as well. It works fine! And it’s Good!! If you make more than 1 pound dose the recipe double ?? This recipe works for about 1-1.5 pounds of pork chops. Any more than that and I would increase the soup and water. I just cooked mine for 4 hours on low & the pork seems dry?!?! What happened? I have no idea Diana, mine never turns out dry. Where your pork chops thin? I’ve made this before with a pound of pork but what if I use 2 lbs?! Still cook it 4 hours low?! I’ve done up to 2 pounds with this recipe as is. It didn’t seem like my pork chops were cooked all the way thru. I cooked for low 4 hours then went back and done high for 30 minutes….any help? How thick were your pork chops Kelly? Were they boneless or bone in? Lissa, without the ranch packet you aren’t making “ranch” pork chops. Has anyone actually frozen this and tried it as a freezer meal? Also, if you want to cut out msg from this recipe, I made my own ranch using a dry mix recipe with dried buttermilk. Summer, I haven’t tried it a s a freezer meal but I think it would work. I’m making this right now. It looks and smells so good. Thank you for the recipe. Has anyone ever made this in the pressure cooker?? I never have. I don’t own a pressure cooker. I made this without adding any water (I must’ve missed that part in the recipe) but the sauce melted down to a great consistency. I’ve made this several times because it’s delish and so easy. Tonight I tried it with hidden valleys “spicy ranch” packet and omg it was even better!! So you just put the cream of chicken pork chops & that’s it ? Dominique, there are 4 ingredients in this recipe. Please make sure you read the whole thing. Will it work the same with bone in? Monica, Bone-in chops require more cooking time. I have never tried it that way so I’m not sure how long. Can you bake these in the oven? If so what temp. & how long? Shantelle, I always use my crockpot so I’m not sure about doing it in the oven. Just made these tonight and they were so good. The only thing is half of them were light pink all over and the rest were white and falling apart (yum). I used 4 boneless and they were maybe a inch thick. This is something im definitely gonna make again. Do i need to cook them a bit longer or will it make the others dry? Hi! Any chance you know the calorie content of a serving? The last time I made this deliciousness, I was not on a diet! Kristy, sorry, no I don’t. This is a deliciously simple recipe. You can’t go wrong. One thing I did differently was to place the pork chops on a layer of onions. So good. I am wanting to make 8 chops instead of 4. I am doubling the recipe but how long should they cook for? Trying these tonight. Not sure if it works like this but can I cook on high for 2 hours instead of on low for 4? Daisy, I’m so glad you enjoyed it! Can i do a double batch and just double The ingredients? Also can I cook on low for eight hours? Krista, I’ve never doubled it so I’m not sure on the cook time. 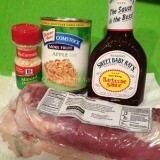 I did 21/2 pounds da of boneless pork chops with 2 cans of soup, 2 ranch packs and 3/4 water! Have it in crockpot on low for 6 hours. I don’t have option to put in later as I will be working.. I will have in crockpot for 6 1/2 for 6 pork chops. Will it be too overdone ? I was just curious if mixing regular Ranch dressing would work instead of a package of the ranch? And maybe not add as much water. Dianne, I have no idea how that would work since I have never done it that way. I tried this recipe with boneless chicken breasts. My husband and I like it better. We eat this with wide egg noodles. Save yourself some time. Use crockpot liners. I make these all the time but I do 1 can cream of chicken, 1 can cream of celery and 1 can cream of mushroom. I add 2 dry ranch packets and mix together. I leave the water out and cook them on low for 6 hours. They are so good!!! Cooked 6.5 hours on low and doubled the sauce. Amazing! Oh and served over rice..
Made a double batch. Used a large onion sliced on bottom without spraying pan. Just doubled everything with the exception of water. I knew I would want a thicker sauce so I only used 1/2 a can for double batch. Cooked on low for 6 hours. Meat was moist and tender, flavor was delicious. I will definitely be using it again. Plan on using it for chicken breast in the future as well. Thanks fora wonderful quick and easy go to recipe. I made this exactly as stated (except in oven instead of crockpot) and it was perfect. Not watery at all. I added cooked noodles to bottom of panes baking dish. Then pork chops on top and poured soup mixture on top and baked on 400 for 30 min. It probably would have been better in the crockpot, but it was still great. I just forgot it was a crockpot recipe so I just fixed it for the oven since I didn’t have that much time to wait on it to cook. I saw that someone asked this already but did not see an answer. Any idea if cooking it on high for 2 hours will work?? I’m so sorry they came out watery yet dry, I’ve never had that problem. I used cream of chicken with herbs instead of regular cream of chicken- it was fantastic! I got Dip mix instead of dressing mix by mistake. Since its 10 miles to the nearest grocery store I used dip mix!! Lol. It will be ok we eat anything !! Can I add egg noodles to crock pot like a half an hour before pork chops are finished? Is there enough liquid to do that? Just put these in the crockpot…2 thick boneless chops (which I browned). Replaced water with a split of white wine….also added a box of fresh sliced mushrooms. Will serve with mashed cauliflower and green beans. Easy peasy! I make this about once a week. My husband and I love it! I always put my chops in frozen, I never add additional water since the water will come from my frozen chops. They are always tender and the sauce is not watery. I am wondering if you could put both chicken and pork in together and cook it? I guess you could if you wanted to, but why? Can I use thin sliced (breakfast) pork chops for about 2-3 hours on low? Courtney, I don’t know, I’ve never tried. 4 hours is the fast cook time. 6 hours on slow of you want/ like super tender pork chops with this recipe. Everyone does what works for them. Crockpot temperatures differ just like ovens. This was very easy and it was delicious. At first I thought the sauce was too thin so added another soup. It did thicken up after I turned the Crock-Pot off after 4 hours. In the crock pot now….I must say the house smells delicious….I hope it tastes delicious as well…. Is it possible to double the recipe? I have two men in my house who like to eat and need to be satified when they’re done. One pork chop each just will not do it. Sharon, I would think so. I made this tonight and it was amazingly delicious. Next time however I will definitely use corn starch to thicken the gravy! Leave out the water made it to runny had to thicken it up….I added fresh mushrooms to it. Otherwise it was good. Sue, glad you liked it. Mine never gets too runny so I’m not sure why some people have that problem. Can I use ranch dip mix instead of ranch dressing mix? You can but it is a different product and will taste different. I searched this many times because of the cook time. Everywhere else said high for 4 hours, low for 6 hours. I’ll be trying the 6 hours! I made it a few years ago and it was delicious! Got them in crockpot now. Can’t wait. Serving with rice, corn on cob and a salad. After a long busy Monday, hubby will enjoy this.